The VA home loan benefits are many but the most popular features are the no-money down component, relaxed qualifying guidelines and reduced closing costs. Qualifying VA borrowers are limited to the types of closing costs they’re allowed to pay, such charges for appraisals, credit reports and discount points and origination fees among others. 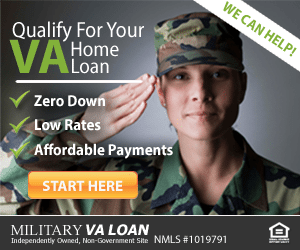 Check today’s VA home loan rates. Among these fees, discount points and origination charges are often confused with one another, as both are listed as a percentage of the loan amount. Let’s take a look at the differences between the two, and how to choose the right rate and fees based on your situation. A discount point, commonly called a “point” is a form of prepaid interest to the lender and expressed as a percentage of the loan. One point on a $200,000 VA loan is $2,000 and two points equals $4,000 and so on. The discount point is so-called because it discounts the interest rate on a veteran’s home loan. For example, a borrower has an option to pay no points, one point or two points when selecting an interest rate. Rates are even available with one-half, five-eighths and three-quarter point offerings. The more points paid, the lower the interest rate received. Get a rate and discount point quote for your loan. Say the VA $200,000 loan used to buy a single family home has a 30 year fixed rate today of 3.25% (APR 3.53%) with no points. The principal and interest payment is $870.41. If the borrower lowers the interest rate to 3.125% (APR 3.48%) by paying one point, the principal and interest payment is reduced to $856.75 for a savings of $13.66 per month. Does it make sense to pay a point in this scenario? To find out, divide the monthly savings into the point paid. In this instance, divide $13.66 into $2,000. The answer is how many months it takes to recover the additional amounts paid in points, or just over 146 months. That’s more than 12 years. 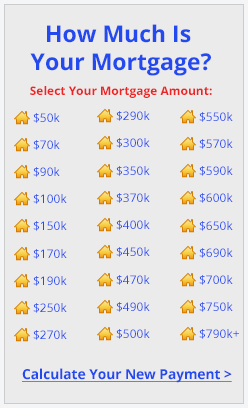 In this example, it makes sense to take the slightly higher rate and keep the $2,000. Click here for a free VA rate and point quote. If you’re refinancing a current VA mortgage, then you’ll encounter the Interest Rate Reduction Refinance Loan, or IRRRL, commonly known as the VA streamline. The VA streamline is a reduced documentation refinance program that requires no paycheck stubs, tax returns or employment verification. Check today’s VA streamline refinance (IRRRL) rates. Should points be used to lower an IRRRL rate? The same logic should be used as with the VA home purchase scenario. Divide the monthly savings into the additional upfront cost. If it takes longer than two to three years to recover the extra expense, it’s probably better to take the slightly higher rate. The exception would be if you absolutely know you will not sell or refinance the house until it’s paid off. But it’s hard to be that certain. Most people sell or refinance within seven years. Let’s look at how to calculate a payback period. Assume it costs two points, or $4,000, to reduce a $200,000 VA streamline rate by 0.50%. The rate reduction would yield about a $55 per month savings. Dividing $4,000 by $55, it would take 72 months or 6 years to make back the money. But let’s things changed and now it only costs one point to reduce the rate by 0.75%. Now you can reduce your payment by $110 per month for only $2,000 in extra upfront fees. Suddenly it pencils out. It only takes 18 months to earn back the extra cost, and all savings after the 18-month mark is extra money in your pocket. 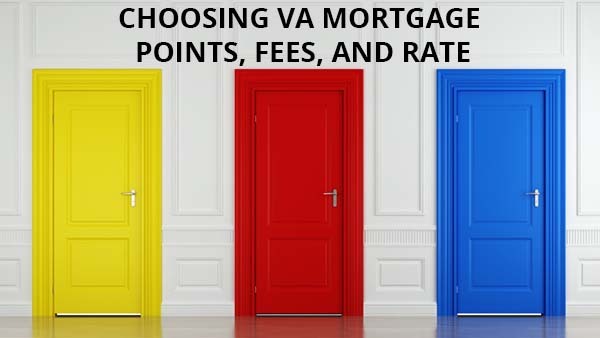 Deciding whether to pay or not pay a discount point in conjunction with any VA loan is simply a matter of doing some quick math and comparing that to your long-term goals with your home and mortgage. An origination fee is a fee that the VA borrower pays to the VA lender. It is usually expressed as a percentage of the loan amount. But a loan origination fee does not directly lower your rate, unlike a discount fee. Basically the VA origination fee is the mortgage broker’s profit, to pay for overhead, pay for employees, and otherwise keep the office running and continue to offer VA loans. The most common amount of an origination fee is one percent. On a $200,000 VA loan that would be $2,000. An origination fee can be charged to a VA-qualified borrower in lieu of other charges associated with processing, underwriting and overseeing the loan through the VA approval process. Getting a loan through the process can be quite expensive, which is why many lenders charge the origination fee. Talk to a VA-approved lender about origination fee and discount points. Should You Take a Higher Rate and Receive A Lender Credit? Just as lenders can lower an interest rate by charging the borrower a point, the lender may also provide a credit toward a borrower’s closing costs by increasing the interest rate. Determining whether or not to increase a rate to offset closing costs is decided in the very same fashion as paying points: cost vs. benefit. For instance, a borrower could select a rate that’s 0.25% higher than market rates at the time. In exchange, the lender can offer a credit of, say, one point, to help pay for closing costs like appraisal, title, and processing fees. On a $200,000 mortgage, the borrower would receive $2,000 toward closing costs but pay $30 more per month on their mortgage. This option could work well for home buyers without enough money for closing costs. Find out if a lender credit is available in your situation by contacting us. Would you consider paying $27.68 more each month if you saved $2,000? That’s how to evaluate paying points, origination fees and closing costs with a VA home loan. Determine how much you will save, the extra cost, when you get a return on your investment. Contact us today here or at (866) 240-3742 to find out about your VA purchase or refinance rate and point options. All scenarios assume a single family residence, final loan amount of $200,000 after the funding fee of 2.15% for purchase and .50% for IRRRL, and a 100% LTV. Final APR based on closing costs of $3000, plus funding fee, plus stated origination fee or discount.